Stansted Airport transfers to and from central London are easy with our bus service to Victoria. The service takes between 105 and 130 minutes, depending on the time of day. 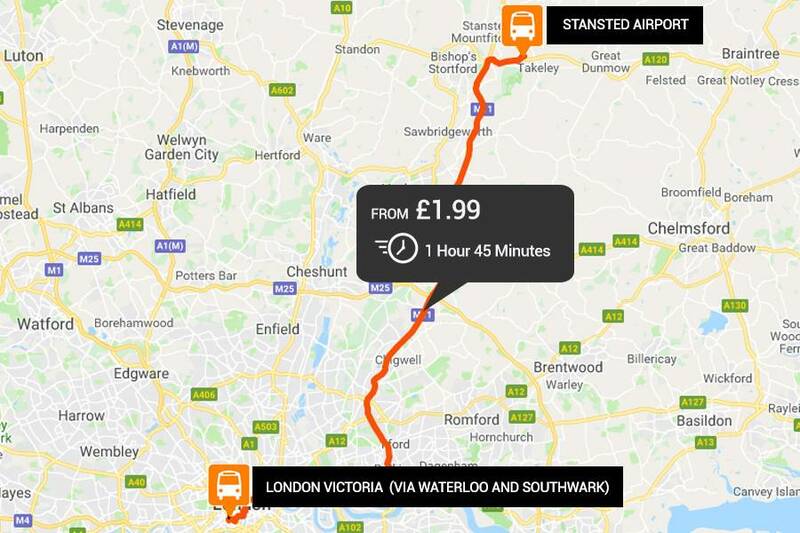 Not only that, the transfer service runs every 15 minutes and operates from 12 am to 11 pm from Victoria Bus Station, and 12 am to 11 pm from Stansted Airport. Our pick-up and drop-off points in Victoria are located at the main bus station as well as Buckingham Palace road; which is just a short distance from Victoria traintube station. Please check your ticket to see which stop is the correct one. Please Note: This route is operated by National Express. Pick-up and Drop off Locations can be found on your booking ticket. Ne vous inquiétez pas si votre vol arrive tôt ou tard! Don’t worry if your flight arrives early or late, you may use the same ticket at no extra cost to travel on the next available Stansted airport transfer bus, up to 60 minutes either side of your booked time. Please note that we cannot always guarantee that there will be spare seats, especially at busy times, since passengers travelling on their booked service have their seats reserved; and will therefore be embarked first. For passengers travelling from London to Gatwick airport, we strongly recommend travelling on the service for which you are booked, as it is not always possible to transfer to an alternative. Normal ticket desk fares would be chargeable outside of the 60-minute time period specified in the policy.